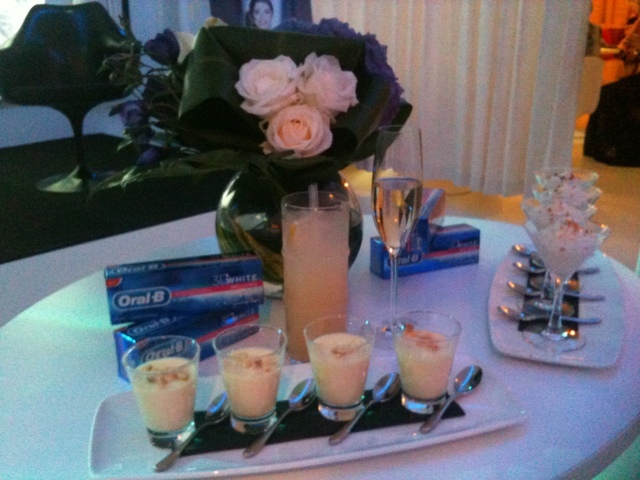 On Monday night I hopped on a train to London to attend the launch event of Oral-B's new 3D White toothpaste. As much as I love a good dental hygiene product, I must admit the main pull was to meet their new brand ambassador, the stunning Holly Willoughby. Dr Uchenna, Oral-B' Dental Guru was also present to explain the science behind the new paste. 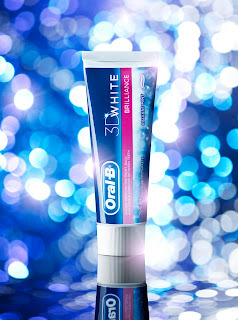 It has a three pronged attack on whitening teeth; the unique silica cleaning and polishing system lifts stains, whereas the pyrophosphate sticks to the teeth to prevent tartar build up and future colouring. Finally the floride technology helps strengthen, protect and repair the teeth. Dr Uchenna also recommends going to our dentist for professional treatment to remove the deeper and more stubborn colouring. I've always been worried that this could damage the enamel, but she assured me that although there could be temporary sensitivity there will be no lasting damage. To promote beautiful white teeth everything at the event was white too, yummy lychee cocktails and white chocolate mousse -yummy! I have just started using the toothpaste and although I haven't seen a dramatic difference, being a non smoker my teeth aren't partially stained, but I'll keep you posted. Importantly it tastes like a normal toothpaste, so no weird flavourings to get used to, it is also reasonable priced with a rrp of £3.49.